Six months ago our little baby boy was born. In many ways, these have been both the longest and shortest six months of my life. My wife and I have laughed together, cried together, and marveled as we watched him progress from a crying, pooping paperweight to a somewhat-mobile, somewhat-interactive sleep-fighting machine. At six months, he has begun to show signs of a developing personality, an insatiable curiosity, and even a sense of humor. Baby laughs are one of the most precious and endearing sounds imaginable. The sleep-deprivation has been the toughest part of raising this kiddo. We keep hearing stories from friends – while we seethe with frustration – about how their babies started sleeping 8-12 hours straight once they hit x-age. Not our baby. I can say with certainty that his personal record has been five consecutive hours of sleep, and that only happened once. Most of the time he averages 2-3 hours, including at night. The poor guy needs sleep training, and we’re working on that. Crossing my fingers…. We had high hopes of exclusively breastfeeding our son. Our little bundle of terror joy was premature and had a terrible time latching, so we ended up getting a hand-pump, as our insurance company only covered hand-held breast pumps. After a couple of months, we relented and started supplementing with formula. The baby still gets breastmilk daily, but my wife is down to pumping twice a day. Lofty ideals are great, but I don’t think it’s the end of the world to supplement with formula. My wife was 100% formula fed, while I was 50-50, and we both turned out fine. Supplementing with formula means that it’s easier for me to take night-time feedings while my wife gets much-needed sleep, so everyone is happy with this arrangement. By the way, the best deal we found on formula is Costco’s in-house brand (Kirkland), which is available in 36-ounce containers for just under $17. I have no problem with generic formula, as it all has to meet FDA standards. Most brands probably roll out of the same factory anyway. On a related note, we found out that we were eligible for WIC, which would provide us with free (or heavily discounted) formula, but we did not accept it. The way I see it, government assistance should be reserved for those who truly need it, and we don’t need it. Perhaps that’s a naive viewpoint to take, as I’m sure lots of people unnecessarily suckle on the government’s teat, but I can ultimately only be responsible for my own behavior. Cost so far: We’ve bought four or five cans of formula from Costco, totaling no more than $85 over a six-month period. To cloth or not to cloth? That was the question, and our answer was in moderation. We’re using cloth diapers as much as reasonably possible, then using disposables at night or when we’re going to be out of the house for a while. My wife recently quit her part-time teaching job to stay at home with the baby, so we’re shifting to more cloth, even at night. For cloth diapers, we ended up getting a mixed batch of pre-folds (like these from OsoCozy), all-in-ones, and pocket diapers. My wife likes the pre-folds, while my favorites are the pocket diapers. I was admittedly intimidated by cloth diapers at first, but enjoy them more than disposables now (well, as much as anyone can “enjoy” changing a diaper). When they’re dirty, we throw away the paper liner and pitch the rest into a diaper bag. Once they reach critical mass, we chuck the lot of them into our front-loading washing machine and let them air-dry on our indoor drying rack. No stains, no muss or fuss, and there’s less waste clogging up a landfill. Regarding disposables, the best bang for the buck that we’ve found is Luvs Premium Stretch Diapers on Amazon Mom paired with Subscribe & Save. Amazon often has Luvs coupons available as well, meaning that we’ve paid an average of roughly $0.10 per diaper. Cost so far: We’ve bought four boxes of disposable diapers, plus the upfront cost of the cloth diapers, which were bought new, but on sale (the pocket diapers we found for $3.50 each, which is fantastic). All told I’d estimate that we’ve spent $200 on diapers so far. All of our baby wipes have come from Costco (the amazing Kirkland boxes of 900 wipes), all of which were purchased with a coupon. This brings our total diaper/wipe cost up to roughly $230. We’re not likely to buy many more diapers now that my wife is a stay-at-home mom. Cloth is king. Here’s an area in which we’ve spent almost nothing. Friends and family have provided almost all the clothes and toys that we own. Baby showers were great for this, but – even though we don’t ask for them – the clothes continue to roll in from the grandparents (on both sides), for whom this is their first grandchild. My own parents are older (well, in their 70s), and they’re positively tickled pink to spoil this kiddo. My mother admitted to me that she’s been stockpiling toys for ten years in anticipation of a grandchild! Regarding toys, he has some, but he’s just as content to be held, or to play with a piece of cloth, or daddy’s glasses, or the edge of a yoga mat, or some other decidedly non-toy object. We expect this will continue and will resist buying him too many toys. After all, a kid with a cardboard box is in heaven. Most importantly, even if he doesn’t have tons of toys, the most-important gift that we can give him is a stable, loving household, and that’s exactly what we plan to deliver to him every single day. Cost so far: I think we spent $5 on one toy. Everything else has been covered by friends, family, or gift cards. What I’ve learnt so far is that having a kid is decidedly difficult, but is only as expensive as you allow it to be. Babies don’t need much: some food, some diapers, and – above all else – babies need you in order to feel secure, knowing that someone is there to provide for them and keep them from harm. That’s about it. Babies don’t need designer clothes or fancy whiz-bang toys that promise to turn them into geniuses – the human race has survived and propagated for many-thousands of years without these amenities, and babies haven’t changed much during this time. Personally, the most-challenging aspect so far is not having any family nearby. My wife and I live in Texas while our families live in Georgia. Aside from a few short visits, we’ve been on our own to raise this baby, and there have been plenty of times in which I’ve been ready to trade my entire net worth just to have someone else help feed, change, and jiggle the kiddo. We’re making a trip to GA in June, and especially once we endure the long drive there, I’ll be more than glad to walk through the door, pass the baby to an eager grandparent, and go drink a beer by the pool. Speaking as a male, raising a baby is tough work, especially for an active father (one who helps feed and change diapers). I spent enough time in graduate school to earn a doctorate, and I’m more exhausted now than at any other time. On the other hand, I think I’m happier than I’ve ever been as well. I’m glad to be a part of this kid’s life, and I’m also glad to know that babies don’t have to cost much. Including the car-seat, I’m sure we have spent less than $500 on him. 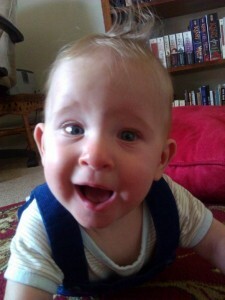 And now that he’s six-months old, I feel like the biggest challenges have been overcome. At least – that is – until he becomes a teenager.